The NBA trade deadline is just under 48 hours away and, so far, there have not been any rumors involving the Denver Nuggets. Still, despite the lack of activity, what options do the Nuggets have before the trade deadline arrives on Thursday, February 7th at 3pm EST? Well, the spectrum of possibilities is as vast and abstract as looking through a kaleidoscope. On one hand, Denver has the assets to force their way into trade talks for Anthony Davis. There has not been a rumor or a report that Denver has called about what it would take to acquire Davis, but if Denver pushed their chips to the center of the table, they could put together an intriguing offer and get themselves a seat at the table. If they did not want to go all-in for a star player, Denver could also elect to use the deadline to consolidate their incredibly deep roster and try to turn some young players into future draft selections. With players like Trey Lyles and Tyler Lydon not fitting into the long-term plans for Denver, maybe Connelly will feel that he should try to turn them into future assets instead of losing them for nothing. Inversely, Denver could literally do nothing as the trade deadline comes and goes. Connelly has done a masterful job of building Denver’s roster through the draft and, because of all of the success Connelly has had with his draft picks, Denver has plenty of depth and talent to fall back on. They do not have a glaring need to address before the trade deadline arrives. The reason that Denver has such a wide range of possibilities is because of their combination of draft picks, young players, established veterans, and blue-chip prospects. If Denver felt like it, they could get involved in pretty much any potential trade they want. Denver has two blue-chip prospects that could be included in a deal for a star player if Denver felt the need. Jamal Murray is still on his rookie contract, is 21 years old, and is averaging 18.5 points, 4.4 rebounds, and 4.9 assists per game. He has only missed seven games in over more than two and a half seasons and has emerged as one of the best young scoring guards in the NBA. Gary Harris is the second blue-chip prospect in Denver. Harris, who has emerged as one of the most underrated two-way players in the league, is in the first year of a four-year contract extension worth up to $84 million including incentives. He is a lights-out shooter from 3-point range, is a great finisher at the rim, is a on-ball terror as a defender, and is locked in for four years on a generally cheap contract considering his production level. Harris is also still just 24 years old. I can already here people from hear yelling about Nikola Jokic being a blue-chip prospect. Of course he is, but there is not one single scenario in which Jokic is involved in trade talks. If Denver decided to let the Anthony Davis trade deadline fiasco pass them by, they still have a plethora of young players that could bring back a solid return of draft picks or players that Connelly has identified as potential trade targets. The most valuable of this tier of players has to be Malik Beasley, who has take a gargantuan leap this season. Beasley, through 53 games this season, has already more than doubled his minutes from his first two seasons. As Beasley has been given more minutes, his production has spiked as well. With the Nuggets dealing with a plague of injury issues, Beasley has been asked to step up in a big way and he has accepted the challenge. In his last 15 games, Beasley is averaging 16.8 points, 2.3 rebounds, and 1.5 assists per game while shooting 58.2 percent from the field and 50.5 percent from 3-point range. Over the course of the whole season, Beasley is shooting 43.3 percent from 3-point range which is basically the basketball version of molten lava. He also has a true shooting percentage 63.3 percent which is the second-best mark in the league among qualified guards which is behind only Stephen Curry. Simply stated, Beasley has blown up in a big way. The second most valuable player in this tier is Monte Morris, who is virtually untouchable because of the incredible value that his contract provides. During last summer, Morris signed a three-year deal worth a total of $4.8 million. That deal is an absolute steal considering how much Morris helps the Nuggets. Not only is Morris already one of the best backup point guards in the league, but he could probably start for a handful of teams. Morris is shooting an obnoxious 44.3 percent from 3-point distance this year and is currently second in the league in assist-to-turnover ratio which is his best skill. He is currently averaging 5.9 assists per each turnover. The last three players in this tier are not quite as valuable as Morris or Beasley, but they are still helpful players with untapped upside. Torrey Craig is a multi-positional defender who is also a ferocious rebounded on both ends of the floor. In addition to his undying motor. Craig is also a slightly below average — but passable — 3-point shooter in addition to being extremely athletic and long. If a team Denver was trading with wanted to take back an athletic and long defender, Craig fits the bill extremely well. Juancho Hernangomez is an incredibly gifted shooter who is still filling in the rest of his game. If he is playing a strong playmaker who can feed him the ball in catch-and-shoot situations, he could be a very enticing prospect for a team looking for spacing from a combo forward. He still has a ways to go as a defender, but shooting is a skill that every team could use. Jarred Vanderbilt is the last player in this their, but like Morris, there is almost no chance Denver would include him in a deal. He just finally returned from foot surgery and is getting his legs back under him in the G-League. His value is too low after the injures to consider moving him unless an opposing team asked for him in a blockbuster type trade. In order to make any trade happen that would improve Denver’s roster, the Nuggets would most likely need to match salary with whoever they are trading with. That means they need players on value contracts that are established veterans. Denver has three such players in Mason Plumlee, Paul Millsap, and Will Barton. Denver does not want to part with any of one player out of that trio, but if a blockbuster deal appeared that Tim Connelly could not say no to, one of those players would almost certainly have to be involved. Actually, Denver having those three players on the contracts they have is actually a blessing if they are determined to make a move. When looking at Millsap’s current contract, his $30 million number tends to scare people pretty quickly, but that fear fades once the realization of his 2019-20 team option sets in. Essentially, anyone who would receive Millsap in a trade would get an extremely helpful player who is a fantastic teammate on what is essentially an expiring contract. Because of the team option, whoever is employing Millsap can decline his option for next season and let him join unrestricted free agency instead of paying him $30 million in 2019-20. Plumlee also fits into the exact same role that Millsap does when it comes to the trade deadline. Plumlee is a helpful player who is a great teammate and is an expiring contract which is why he could be sought after if a sizable trade was to take place. Barton is the least likely of those three to be included in a deal. Barton and Connelly have a relationship that spans more than a decade and Barton just signed a brand new contract this past offseason. He is not an expiring deal which makes him less desirable on the trade market unless a team just so happens to target specifically him. The only way that Barton is moved is if he is requested as a part of a blockbuster trade for a superstar, which is very unlikely anyway. In addition to those established veterans on value contracts, the Nuggets also have additional expiring deals. As stated above, Plumlee is on an expiring contract and Millsap can be perceived as an expiring deal due to there being a team option in the final year of his contact. In addition to the two of them, both Lyles and Lydon are also on expiring deals. 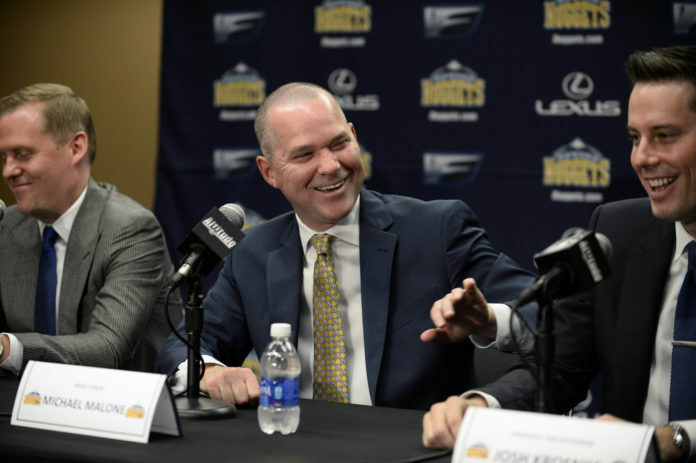 Lyles will be a restricted free agent after this year and Lydon will be an unrestricted free agent after the Nuggets declined their team option for the fourth year of his rookie contract. Lastly, Isaiah Thomas is also on an expiring deal, but the fact that he has not played all year and did not receive a single offer in free agency before this year does not bode well for his trade value. Draft compensation is always an important aspect of trading for a player, but the Nuggets are a bit short on draft selections at the moment. First off, it is important to note that Denver does not have their own first round pick for the upcoming 2019 NBA Draft. They also have a very small possibility of losing their second round pick this year. Denver’s second round pick in 2019 is technically a pick swap with the Washington Wizards and the Nuggets will get the more favorable of the two second rounders. Then, if whichever pick Denver ends up with is the 56th pick or worse, it would then convey to the Milwaukee Bucks. Considering how bad Washington has been this season, it seems nearly inevitable that Denver will end up retaining the Wizards 2019 second-round pick which means Denver would keep it and not send it to Milwaukee. Denver also owes its 2020 second-round pick to the Brooklyn Nets and their 2021 second-round pick to the Philadelphia 76ers. Denver owns their own first-round picks from 2020 and on, but they do not exactly have the same collection of picks as other teams in the league. If there is one hurdle Denver would have to overcome if making a blockbuster deal, it would be their lack of draft picks. So, now that it is clear that the Nuggets have the assets to make virtually any deal happen, what is actually on their list of priorities? Finding a way to replenish draft picks is probably high on the priority list. Denver is without a first-round pick for the 2019 NBA Draft and they also have an outside possibility of losing their 2019 second-round pick to the Bucks if it ends up being lower that the 55th pick. Additionally, Denver does not own the rights to their second-round picks in 2020 and 2021. Connelly has a gift; he is able to find talent in the most obscure ways. Between finding Torrey Craig playing in Australia and trading for Will Barton — who was buried on the bench for the Portland Trail Blazers after being second-round pick — his track record is incredible. In the past four years, Connelly has been able to draft the likes of Nikola Jokic, Monte Morris, and Jarred Vanderbilt in the second round in addition to finding Craig and Barton outside of the draft. Giving Connelly more draft selections will almost always lead to him finding hidden talent so getting him more ammunition to use during the draft should be a priority. The Denver Nuggets have two players on the roster that do not seem to fit the long-term plans of the Nuggets. Lyles is going to be a restricted free agent at the end of the year and, simply stated, when healthy, the Nuggets do not have a need for Lyles; especially with Vanderbilt working his way back to game shape. The same can be said for Lydon, who had the fourth year of his rookie contract declined by the Nuggets earlier this year. Lydon is on his way to unrestricted free agency and will not be a part of the Nuggets plans after this year. If the Nuggets can get draft compensation of any kind for Lydon, they should do so. He is formerly the 24th pick in the draft so maybe Denver can extract a late second-round pick for a team willing to take a flier on the sweet-shooting big. When it comes to Lyles, Denver may be able to get a decent second-round pick for him. Lyles is still just 23 years old and has a modern offensive game for a combo forward. If Denver does not find a way to move either of them before the trade deadline, the odds are high that they will lose both players without any compensation. Connelly is not the type of president of basketball operations who makes reckless decisions, but he is always willing to listen to trade offers or explore interesting opportunities. With the Los Angeles Lakers removing themselves from the Davis trade deadline sweepstakes, it has opened the door for other teams to potentially sneak in and make big offers to the New Orleans Pelicans for Davis. That is why Connelly staying on the phones and listening to all offers should be on the priority list. As stated above, the Nuggets have the assets to involve themselves in any and all trade talks so they might as well see what possibilities exist. Yes, the options are endless for Denver with the trade deadline under two days away, but that does not mean that the Nuggets need to make a trade just to make a trade. The Nuggets have done a wonderful job of building their team through the draft and refusing to mortgage their future for a trade that has the potential to blow up in their face. That is why there is a very real argument that the Nuggets should sit out until the trade deadline passes. With that said, the situation the Nuggets are in has changed thanks to their success. They are no longer the up-and-coming team in the Western Conference that is more concerned with gathering young talent than anything else. Now, Denver is one of the elite teams in the National Basketball Association which means that they could potentially swing for the fences. Only time will tell what the trade deadline has in store.